Owing to the globally rising emphasis on food production & environmental sustainability, the graph of plant growth regulators market has been traversing along a profitable path in the recent times. With an overall industry valuation of USD 5 billion in 2017, the global plant growth regulators industry is now slated to witness a rather commendable commercialization in the coming years. The increasing investment scenarios across the agriculture sector, given the robust global demand for commercial fruits & vegetables, crops, and pulses have further the interest of farmers in PGR which effectively enhances the yield within the available arable land. In fact, if reports are to be believed, the overall alarming state of food security & nutrition in the world have pressurized farmers for producing more yield per arable land and is thus one of the most prominent factors driving the commercialization of the plant growth regulators industry. To elaborate further, according to the global food security challenge – there will be more than 9 billion people to feed by 2050 and the demand for food will be a significant 60% greater than that of today. Given the not so pleasing state of affairs, the United Nations has set on achieving food security, ending hunger, improving nutrition, and sustainable agriculture at the second place of its 17 Sustainable Development Goals (SDGs) for the year 2030. To achieve these objectives, several global farmers and agricultural industry majors are adopting PGR to become more productive, while also promoting sustainable farming with reduced GHG emissions, waste, and water usage. Supportive governmental investment in this regard, is one of the major growth drivers elevating overall PGR demand. The European Union’s plan to invest more than USD 426 billion in its agricultural sector to meet the regional food security challenges is one of the apt instance where increased investment in agricultural will be fuelling the regional plant growth regulators industry share. The rapid development of the industrial as commercial projects across the Europe has majorly impacted the agricultural land usage, in turn impelling the government to promote the use of plant regulators for better crop yields within the available arable land. With such governmental backing and increased consumer awareness regarding the use of PGR, estimates claim that Europe accounted for the highest share in the regional landscape of the global plant growth regulators market in the year 2017. Asia Pacific forms another lucrative investment hub for the global PGR industry players, as some of the regional economies are highly dependent on their agricultural output. Several foreign firms and individual investors are betting big on the Asia Pacific PGR market, on the grounds favorable agricultural policies for farmers and agriculture practitioners in the region. With such initiatives further benefiting farm productivity and overall product awareness, APAC plant growth regulators industry share is anticipated to register the highest y-o-y growth over 2018-2025. Given the growing awareness pertaining to healthy eating, nutrition, and organic foods, the worldwide surge in organic farming techniques has been one of the most significant growth drivers of the plant growth regulators market in the recent years. The fact that the plant growth regulators are defined as any organic compounds with low concentrations (1-10 ng / nl) in inhibiting, promoting, and modifying plant growth & development, has further accelerated the use of PGR as an substitute to synthetic chemicals in organic farming. Further delving deeper, it is imperative to note that based on their actions, PGR are broadly classified into two groups: Plant growth inhibitors and Plant growth promoters. Abscisic acid and Ethylene are grouped into inhibitors while Gibberellins, Cytokinins , and Auxins are grouped into the promoters category. 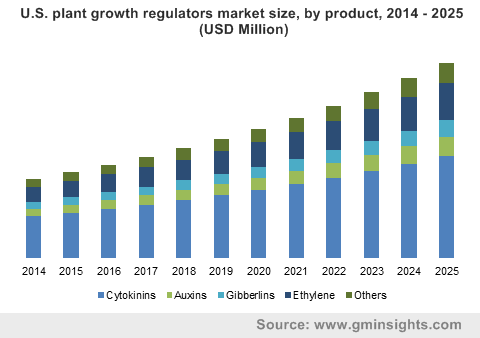 Amongst these, reports state that Cytokinins, accounting for the largest share in global plant growth regulators market in 2017, is further expected to gaining immense traction on account of massive food demand. Cytokinins PGR are used in major crops such as rice, barley, maize, soybean, and wheat where this PGR works as a growth stimulant as well as is useful in cell division and dormancy breaking. Thus, it wouldn’t we wrong to say that the agricultural efficiency brought by these regulators is charting for some next-gen biotechnology concepts in farming. To meet the demand-supply mismatch, the farmers and many other agricultural companies will be seen investing in more such crop promoters & regulators for better crop productivity, which in turn will be driving the commercialization trends of PGR market in the ensuing years. A presumption validating the same is of Global Market Insights, Inc., that claims the global plant growth regulators market to surpass USD 9.7 billion by 2025.